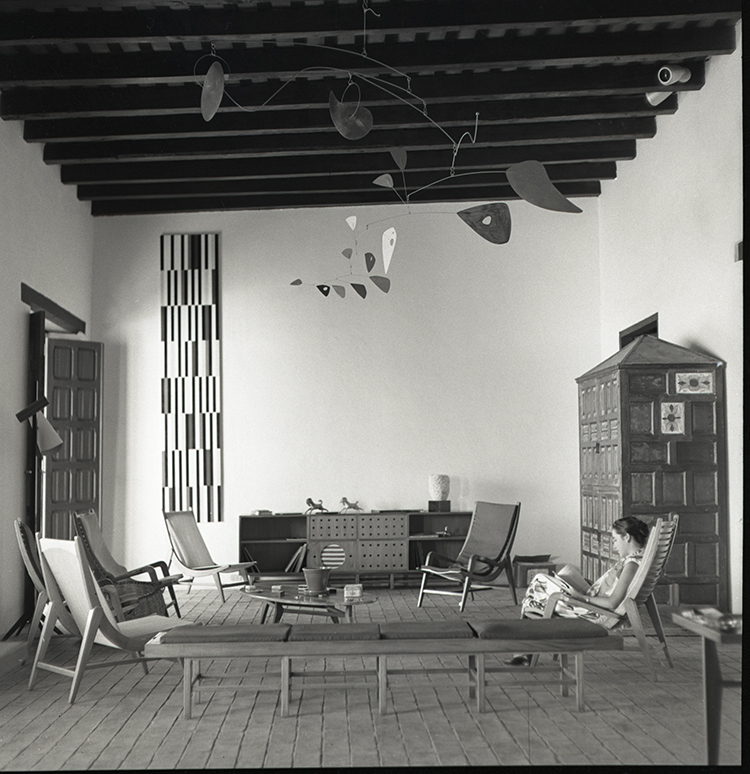 The living room of Alfredo Boulton's beach house on Margarita Island, Venezuela, designed by Miguel Arroyo, circa 1953. Striated shades of wood make up Brazilian designer Joaquim Tenreiro's three-legged chair from 1947. Primavera wood and palm comprise this sinuous woven lounge designed by Michael van Beuren, Klaus Grabe, and Morley Webb in 1950. This prototype fo Venezuelan designer Miguel Arroyo's Butaque Pampatar chair was made from painted mahogany and cedar in 1953. Arroyo designed this slatted-wood coffee table in 1956. One of Brazil's most famous exports, Sérgio Rodrigues created the deliciously slouchy Mole armchair in 1957. Rubén Núñez's glass vase from 1958 features a soft rainbow of colors that wouldn't be out of place with today's iridescent designs. Born in Poland but emerging from the Brazilian design scene, Jorge Zalszupin created this space-age wall-mounted organizer from plastic and mirror in 1970. In the years following WWII, a strain of modernism parallel to those in the U.S. and Europe developed in Latin America, an area sheltered from the destruction of the war. Now, the Blanton Museum of Art in Austin, Texas, is celebrating the region's take on midcentury design with the exhibition Moderno: Design for Living in Brazil, Mexico, and Venezuela, 1940–1978, which runs through Januray 16, 2016. The exhibition brings together more than 130 works, including furniture, ceramics, and graphic design from Lina Bo Bardi, Clara Porset, Miguel Arroyo, Sérgio Rodrigues, and many more.